Home > How can I check the temperature of my CPU? How can I check the temperature of my CPU? For example, if your PC reboots or behaves capriciously after playing Crysis or Unreal Tournament then I would definitely start monitoring your CPU temperature. Additionally, if you’ve overclocked your CPU then this is even more reason to suspect overheating. Perhaps the dust bunnies have gotten the best of your fan or maybe the fan just quit all-together. Are any of the vents of the computer case obstructed? Is your computer in an open, well ventilated area? These are some things to think about as we explore your processor temperature. Windows doesn’t have a built-in way of viewing your CPU temperature. You can’t just go to the Device Manager or System Properties to get that kind of data so we need a specialized tool for the task. There are a lot of options out there such as Speccy and Realtemp but I like Core Temp because it’s super lightweight and doesn’t get in the way. Core Temp is a solid program for viewing CPU temperatures. 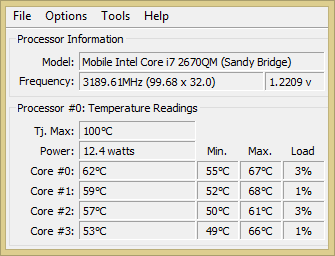 It breaks down the temperature readings by each core so if you have a quad core processor you’ll see four readings. According to the CoreTemp website it gathers the reading near the hottest part of the processing core from a Digital Thermal Sensor sitting on each core so the ratings are more precise than relying an adjacent circuit on the board. When going through the installation make sure you’re cognizant of what each screen is asking from you. When I went through the installation I made sure Extra Languages and Remote Service plugin were disabled. 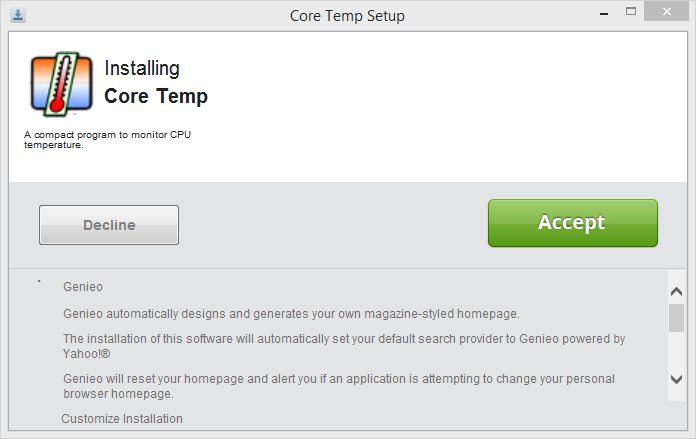 On the next screen you might get duped into installing a Genieo toolbar if you’re not careful. Click Decline to all offers. I had to click decline to three distinct offers! Once you bypass the offer-screen shenanigans open the app and check your readings. If your app doesn’t look like mine just double click a blank part of the window for the “slim view”. The key thing to keep in mind is the Tj. Max value. Incidentally, the Tj. Max value has absolutely nothing to do with the titular American department store that old people love to shop. The Tjunction Max (TjMAX) is the maximum temperature the manufacturer has rated your processor. It is recommended that you keep your stressed processor about 20 degrees Celsius below the Tj. Max value. Anything above 20 degrees is getting in the danger zone. Fortunately Core Temp helps us stay cool with heat protection options. Core Temp has a spiffy little feature called Overheat Protection under the Options menu. 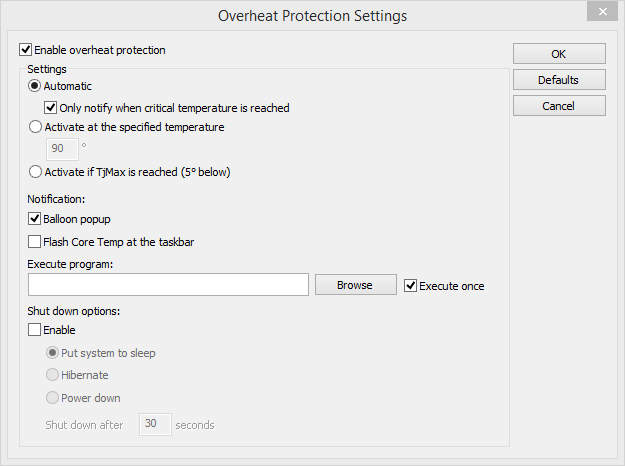 Put a check box in Enable overheat protection located near the very top of the window then set your protection criteria. 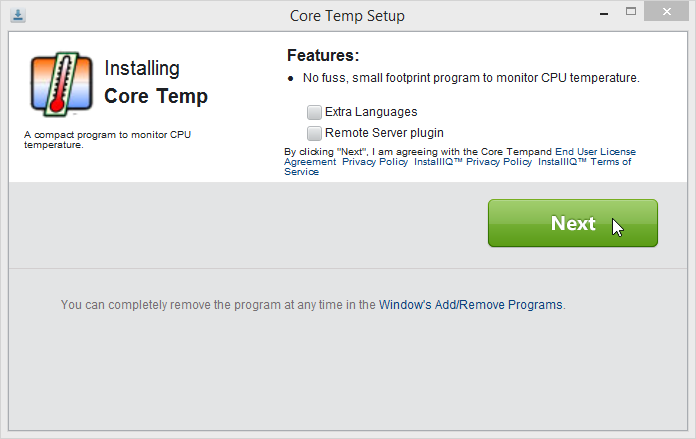 You can tell Core Temp to power down your computer when it reaches a particular temperature threshold and you can have it flash the temperature in the taskbar. I strongly suggest enabling Overheat Protection especially if you have reason to believe a meltdown is immanent. As you can see from the screenshot, my Tj. Max value is 100 degrees Celsius but my max temperature value is only 68 degrees. Keep in mind that I have virtually no load on my computer right now so these values aren’t substantive. (the load column shows my paltry percentages). The real test is to keep this little application running for a few days and pay attention to the temperature values when your PC starts to act skittish. Buy a pack of compressed air for a few bucks. I’ve been using the Dust-off brand and haven’t had any issues with it. The key thing to keep in mind is that you want to target the vents and fan from multiple angles in quick bursts. Also make sure you don’t get too close to the fan or you could damage it. Just keep the pressure low and give it a dozen or so air blasts from different angles. If you have a laptop, flip it over and start dusting the fins. This should be sufficient in most cases; however, if you want to do a really thorough job you should seriously consider removing the case so you can get inside and clean out the fan housing. It’s possible that your fans just gave up on life. You can place your hand or ear by the vents to make sure it’s running. Most fans are ultra quite these days so yours might be inaudible; that’s why I think the best approach is to take your palm and place it about half an inch from the vent to feel for a warm zephyr. A frozen PC could ironically be a harbinger of a melting PC. If your computer is acting loopy even after scanning it for viruses I suggest using Core Temp to investigate the processor temperatures. Make sure the Core values are less than 20 degrees Celsius from the Tj. Max numbers. By the way, you can glance at the temperature readings in the system tray which are continuously sensing your temperature readings. In the graphic below you can see my multi-color temperature quartet in the far left corner of my icon crowd. If these values start climbing into the hot zone power down the PC, grab some compressed air and start cleaning the vents. On this Fourth of July the last thing you want exploding with your fireworks is your laptop. Between grilling burgers, enjoying time with friends and cooling off in the AC, make sure your CPU is as cool as you. Do you know of any other solid CPU monitoring programs out there? ‹ How can I find a directory in Linux from the command line? haha, it’s funny how things have changed. I remember the symmetrical CPU pins. In college my buddy and I often tinkered with build kits from tigerdirect.com and I could never figure out the correct way to install those things. After starting instantly locked up my computer. DON’T download! Fake or malicious program, maybe just broken but I wouldn’t risk it. It will load Bobrowser into your computer regardless how you try to deny it access. Using another computer (Yes – use ANOTHER computer) look up ‘How to Remove the Horrible BoBrowser Adware / Malware’. Check to make sure the article is from http://www.howtogeek.com and proceed to it. It will give you a very thorough step by step instruction on getting rid of BoBrowser. It’s not as simple as uninstalling it from the program manager, it takes a little extra work to get rid of it. Vonnie sure ‘fixed’ things alright. And to add insult to injury, the Core Temp program does not even work properly. I get a reading of 0 deg C on my cores no matter what I do, whether I refresh or not. There are probably other pieces of malware in addition to the BoBrowser which I am using Malwarebytes to get rid of as the howtogeek page recommends. I’m so glad I bought a chromebook a few weeks ago. No way to get viruses and malware on those yet. That’s what I used to find out how to get rid of the BoBrowser. I’ll look a lot more carefully into the other two programs Vonnie mentioned, but given the results here I will do some more browsing about them before taking Vonnie’s word on it. OK just checked out Speccy – It’s safe to use. It will ask you while you are installing it if you want to install CCleaner – click no and that’s it. You only get the free version of Speccy but that’s enough to see what the CPU temp is along with the temp of your motherboard, graphics card and hard drive. Glad I followed through with Speccy – my CPU is in the red at 93 deg C… something isn’t good under the hood. All other temps are 40 deg C and under so I’ll crack the case open tomorrow and see if the fan is dead. go to http://www.piriform.com to get Speccy. I had no problems downloading it from the Piriform site.